These free zones were created with the new ByPlace tool which will soon be available to all Exact Editions publishing partners with apps on the iOS platform. 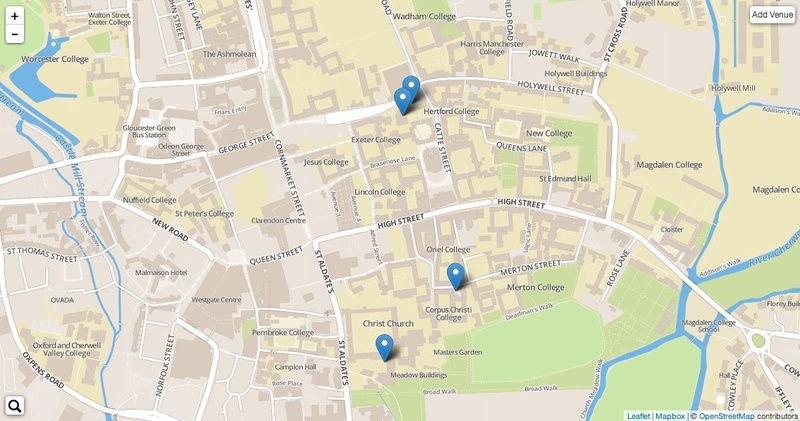 The approximate coverage from each pin covers a circle of say 150 metres from the centre point, so the zone centred on the Christ Church pin will also cover most of Pembroke College. Apologies to Magdalen College and Nuffield for being out of zone! The Literary Review now has a complete archive and all the back issues available within each app are accessible, so there is no shortage of free reading matter. Each of the apps has a comprehensive search function. To enjoy this experience, settle down in the Kings Arms, Blackwells Coffee shop or Wadham’s beautiful gardens, go to the iOS app store (links as above), install the app on an iPhone or iPad, then page through till you get to some locked content, at that point the user is given the option to access free content ByPlace. Switch the button to ‘accept’. As if by mobile magic the content will then be freely available, possibly with a few seconds delay whilst the geolocation is registered. This free resource will also be available at the Hay Festival, the Edinburgh International Book Festival, and the Cheltenham Literature Festival. This free resource is being sponsored by Exact Editions and the publishers concerned.